Patna, India -- The British Army will send about 4,000 of its troops, who are followers of Buddhism, in a group of 100-150 people to spend a week at Bodh Gaya and Sarnath to seek peace after their prolonged involvement in the war zones in different countries such as Afghanistan and Iraq. They will all meditate under the famous tree at Bodh Gaya, where Lord Buddha had attained enlightenment in 6th century B.C. 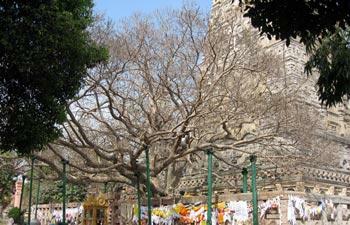 Mahabodhi tree has been declared a world heritage site by the Unesco in 2002. "The British soldiers will start arriving in Bodh Gaya from early next year," Bihar's minister for tourism Sunil Kumar Pintu told Mail Today on Monday. "They will arrive in separate groups of about 100-150 people and meditate under the holy tree. They will continue to arrive here throughout the next year." Pintu said that the troops will spend six days in Bodh Gaya and one day at Sarnath in Uttar Pradesh. The minister said that the tourism department of the Bihar government had entered into an agreement with an international travel agency, to facilitate the trips during the World Tourism Mart held in London last month. "Bihar had taken part in the World Tourism Mart for the first time which was held in London between November 5-8 this year," he said. "It was during that tourism fair that the officials of the British army got in touch with us through the travel agency. We had three rounds of talks in this regard." Pintu said that the exact dates of the British troops had not yet been finalised yet. He stated that the state government would take care of the security of the British soldiers and facilitate their smooth stay in holy south Bihar town. "We will provide our wholehearted support to the British soldiers troops who want to meditate under the Mahabodhi tree," he said. The tourism minister said that the British Army had about 4,000 troops who were followers of Buddhism. "Since Bodh Gaya happens to be the holiest of the holy places for the Buddhists, the British army has decided to arrange the trips for its soldiers," he added. Stating that he had discussed the details of the trip with the British army officials, Pintu said that most of the British troops coming to Bihar had been deployed in the different countries such as Afghanistan and Iraq in recent times. "The visit to Bodh Gaya and Sarnath is aimed at providing them peace and helping them distress them after their experiences in those countries." He said that it was for the first time that such a visit has been organised. Sushil Kumar Singh, managing director of the travel agency, said that his agency had signed an agreement in this regard with the British Army in London month. He said that Dr Sunil Karyakara, a Buddhist chaplain with the British army, had been made the coordinator for the trips. "We have entered into agreement with the British army to bring the stressed soldiers to various places on the Buddhist circuit," he said. "But they would spend most of the time at Bodh Gaya." Singh said that the exact dates of the first round of the soldiers' visit had not been finalised but they would start arriving from early next year. "We will hold a meeting with the British army officials in January to chalk out the final itinerary in which Bihar tourism department officials will also be involved," he said. "The trips would continue in future as well." Bihar has witnessed remarkable rise in the number of tourists from the foreign countries in recent years. Last year, the number of international tourists visiting Bihar was 8.70 lakh which was ten times more than what it used to be a decade ago. This year, 8.40 lakh had already visited the state till August and their number was expected to cross 10 lakh by the end of the year.